Here's a camera I wouldn't normally bother to buy, use, write about or even look at. When I do, it's simply because it was my first camera, given to me as a Christmas present some 30 years ago (1978). "Your new Kodak EK2 Instant camera follow's Kodak's high standards for picture quality and color reproduction using Kodak Instant Print Film. With proper care and handling your camera will provide years of of picture-taking pleasure." Yeah, right. The "Instant Print Film" was first invented and made popular by Polaroid, which introduced their first instant camera in 1948 (!). Kodak introduced their Instant Print Film PR10 in 1976, but withdrew all instant films and cameras from the market in 1986, after losing a patent infringement lawsuit to Polaroid. 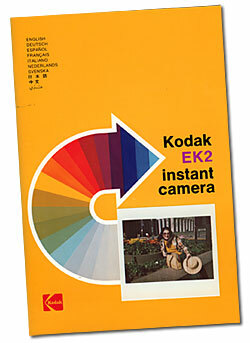 In July 1991, Kodak paid Polaroid $925 million to end the 15-year battle. In other words, you won't find any film for the EK2 any more. Too bad. Or maybe not. Polaroid, by the way, announced their decision to leave the instant film business in February 2008. 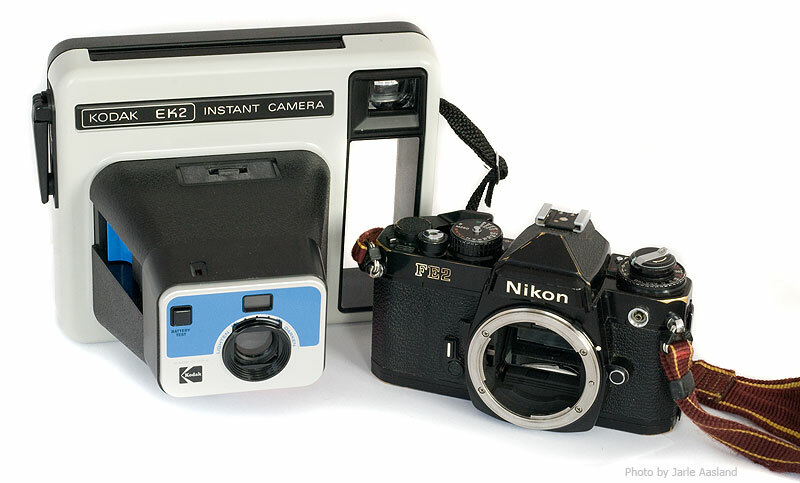 Polaroid's overall revenue from instant cameras, film and other products peaked in 1991 at nearly $3 billion, according to an Associated Press article. But that was then. These days, there's little or no money in film. As we all know, digital now rules the world. Ok, enough history. Back to the EK2. My first camera, and my first real camera: Kodak EK2 and Nikon FE2. Physically, it's a big plastic camera, with an oversized handle on the left hand side. There's a shutter release button on the right, an optical viewfinder, a flash connector (just dig out your old Flipflash) and a hand crank to eject the exposed photos. The camera requires the previously mentioned Instant Print Film PR 10 and a 6V "J-size battery" (which is still sold under many different labels/model numbers, according to a quick Google search). The lens is unmarked, and there's no technical data in the manual. A quick comparison shows that the field of view equals a 35-40mm lens on a standard 35mm camera. There's no exposure control, except that you can make your photos lighter or darker by adjusting the camera's LIGHTEN-DARKEN control.. Supposedly, the original list price was $40. That's about it. I've been browsing some old albums, trying to find a photo taken with this camera, but i can't find any. As far as I can remember, I took only one "film" - ten photos - with my EK2. According to an article written by Annie Wilker at the University of Texas: "Tests on Kodak’s PR 10 film by Wilhelm and Brower have found its light fading stability to be far inferior to Polaroid’s integral products and by far the worst color material ever tested." The worst color material ever tested! It's probably a good thing I couldn't afford to buy any more film. A few years later I saved up my money and bought a brand new Nikon FE2 instead. The world would never be the same! Just for the record: This is not really a collector's item, in my opinion. Unless you're a dedicated Kodak collector, there's no reason to buy one. And if you do, don't waste your money. I've seen these on eBay for around $10, or so. I'm just keeping mine for sentimental reasons.